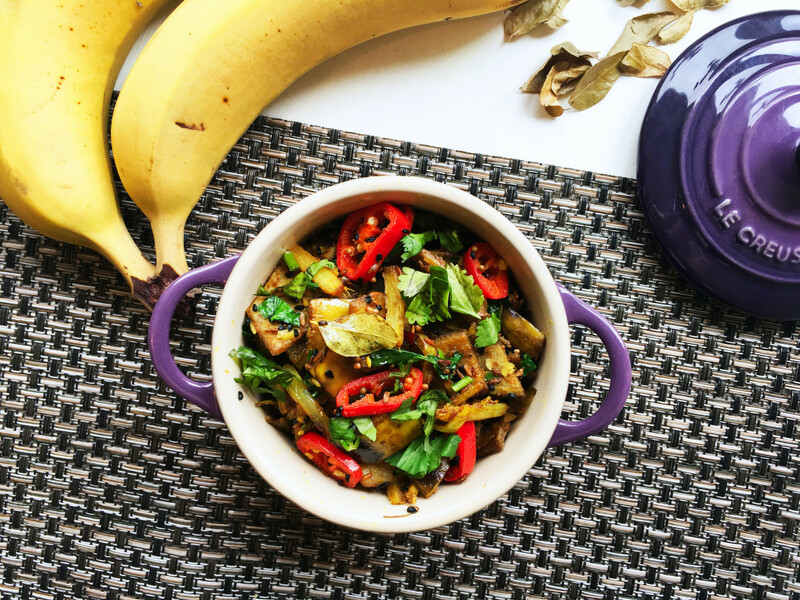 I’ve mentioned before that I often juice and eat my left over banana skins and if you want to know why you can read about the benefits of eating banana skins here. After all primates eat the entire banana so why shouldn’t we? Yup, I eat bananas – skin and all. 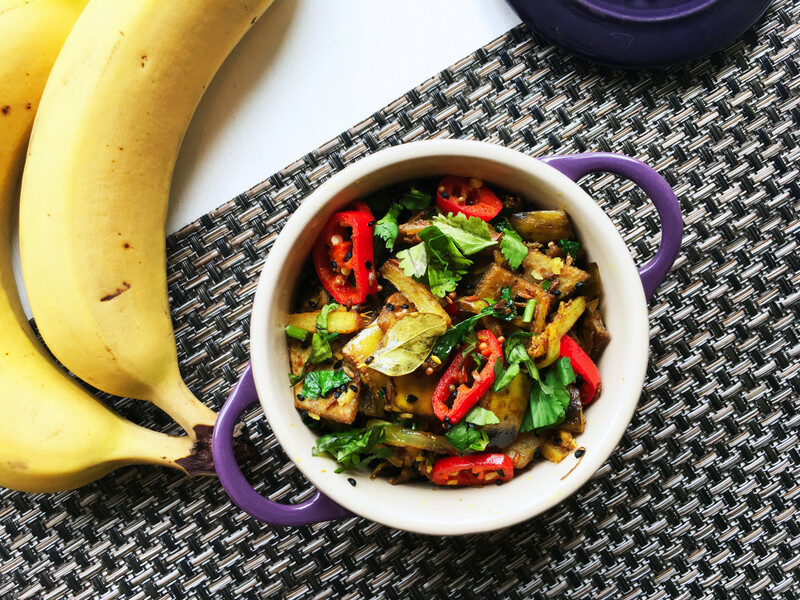 Banana skins are of course naturally rich in potassium and the other trace minerals; chromium, copper, fluoride, manganese, selenium, and zinc. They’re also rich in B vitamins too. 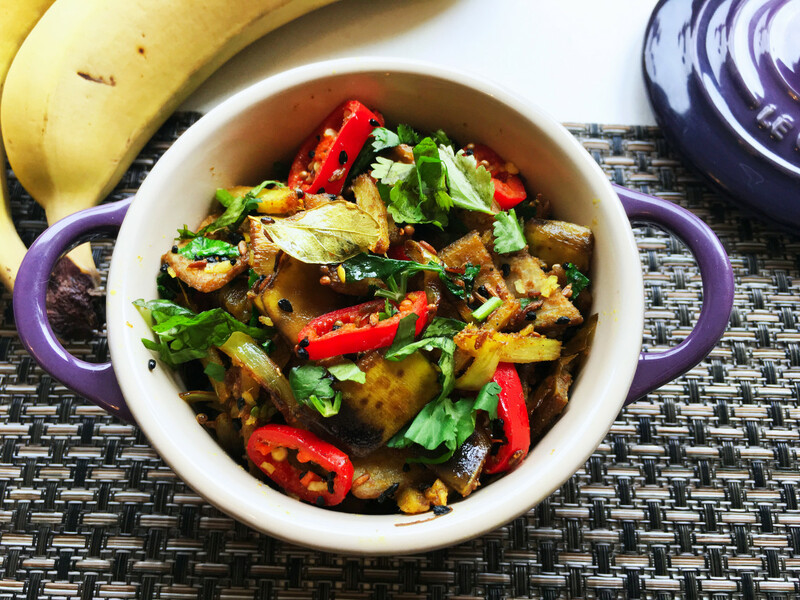 People living in South East Asia and India eat typically cook their banana skins into cakes, desserts, and of course – even curries which is where I got my idea from. 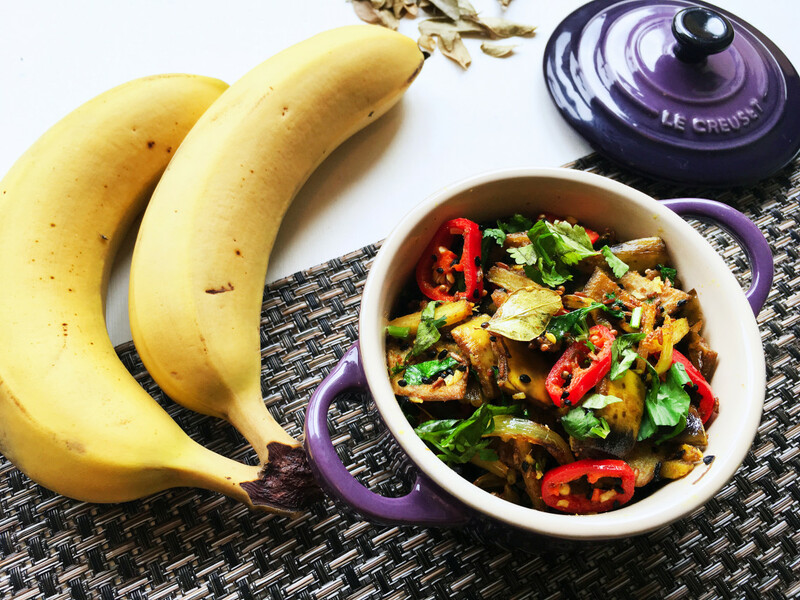 This dish minimises waste within your home, transforming your post smoothie bowl banana skins into an aromatic and fragrant Banana Skin Curry. You’ve probably thought that banana skins are poisonous when eaten raw which is totally not true, although they are pretty tough and not as tasty as the actual banana itself. When cooking with the skins make sure you buy organic bananas and give them a thorough wash before cooking or juicing them. I always like to give my fruit and veg a good wash with Dr Bronner’s Liquid Castile Soap. I’ve been testing out my Wüsthof Classic 3 Piece Knife Set from Haus and the 20cm Cook’s Knife cut through my banana skins like butter, it also made for some super fine slices of onion whilst the 9cm Paring Knife created beautiful diagonal, fine slices of red chilli, minced garlic like there was no tomorrow, and peeled shredded my fresh root ginger to perfection. To read my review in full and for the opportunity to win your very own Wüsthof knife set just click here. 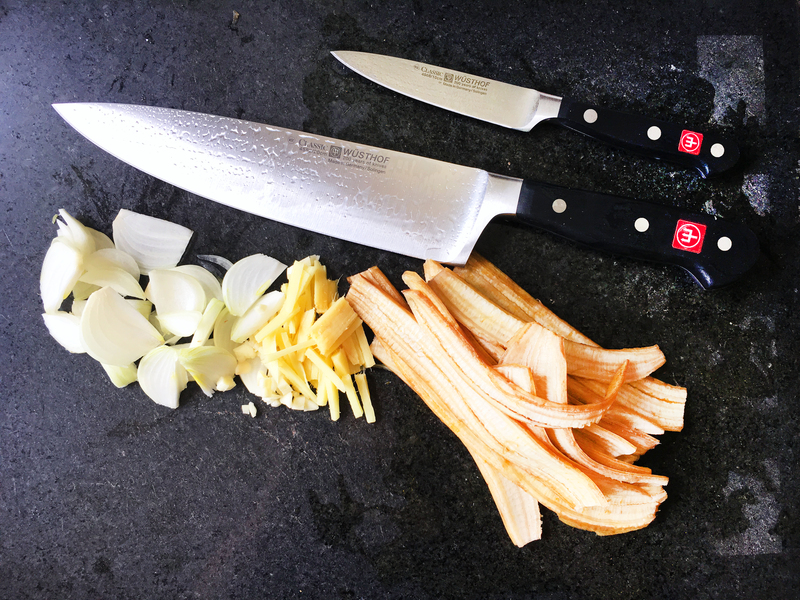 Preparing my banana skin curry with my Wüsthof Classic Cook’s and Paring Knives. 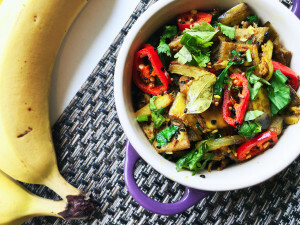 It’s best to use greener banana skins for this curry than the more ripe ones however they are still tasty either way. Banana skins have a really mild banana like taste and are more savoury than they are sweet. 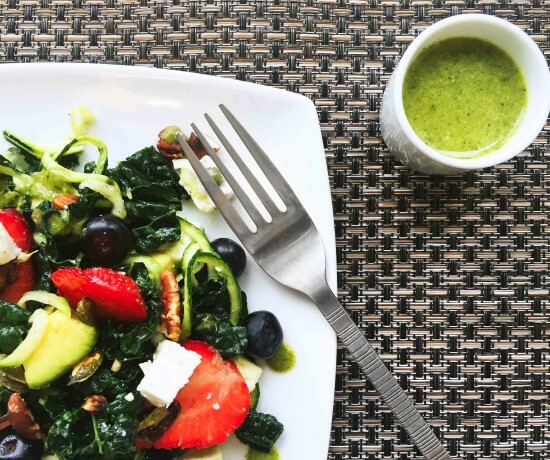 They add a different dimension to a dish making it more fragrant and pleasant on the palate. 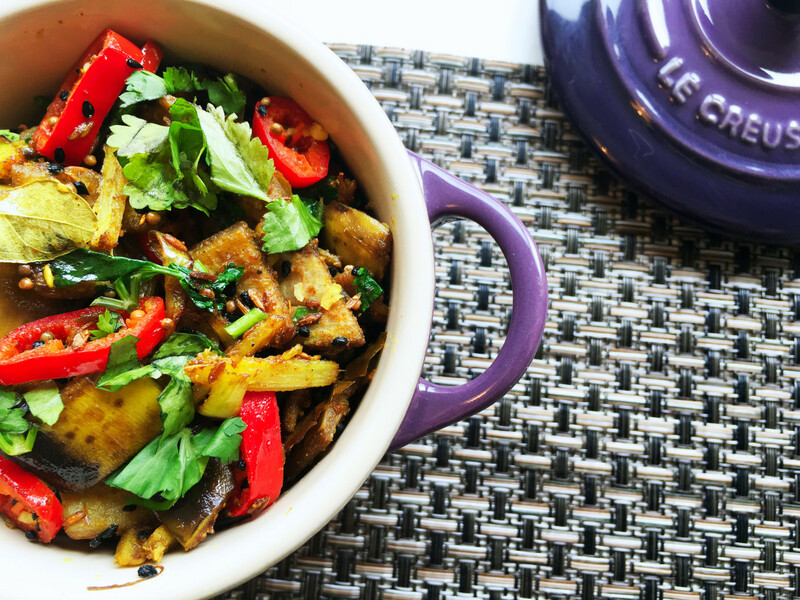 This curry is super easy to make and combines some gorgeous spices and flavours together for a mild yet aromatic dish. So don’t throw out your banana skins after making your beloved smoothie bowls, banana breads, or feeding your rambunctious toddlers – wash them, soak them, and chuck them into this wonderful curry! 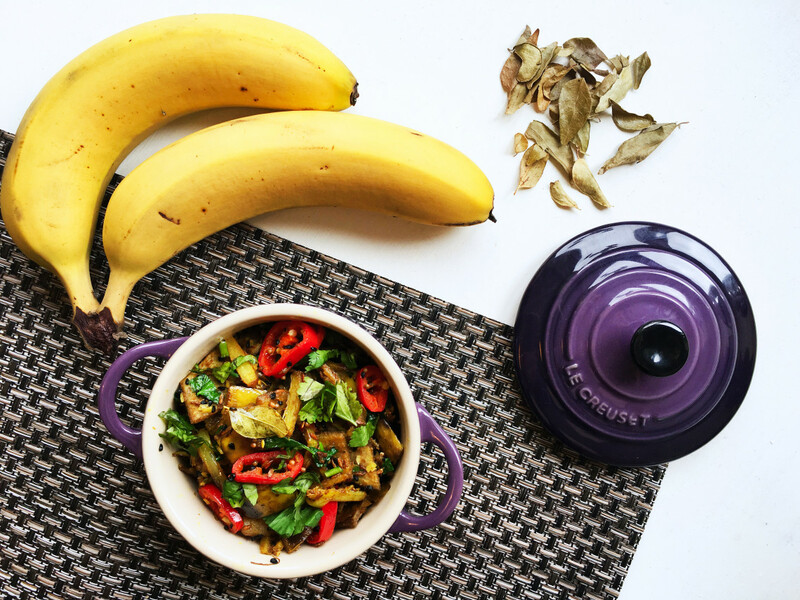 This dish minimises waste within your home, transforming your post smoothie bowl banana skins into an aromatic and fragrant Banana Skin Curry. 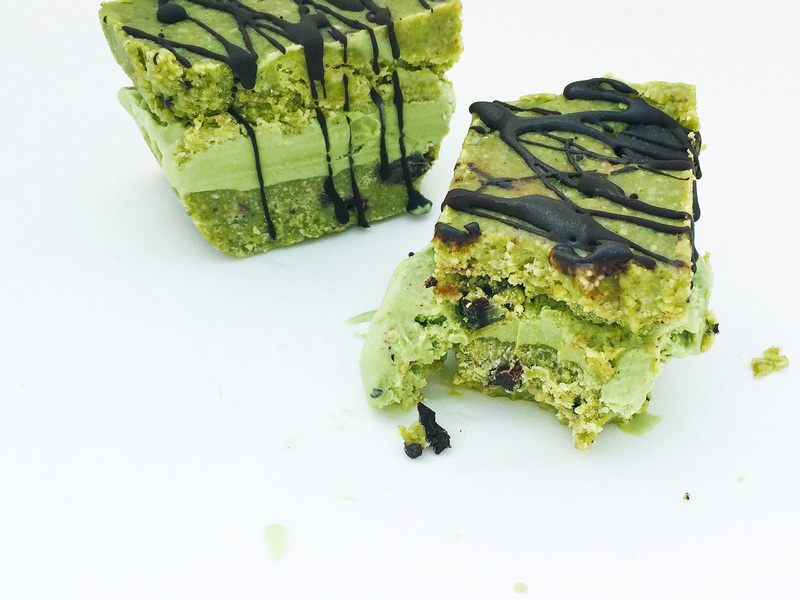 Suitable for vegans and those following a Paleo diet. Start by thoroughly washing your banana skins removing the woody stalks. Fill a bowl with water and ¼ tsp of ground turmeric and soak your banana skins for 30 minutes to help preventing the from darkening and to soften them a little. Remove your banana skins from the water and slice off any large blackened, dark spots from the peels if there are any. You can either finely slice your banana skins or roughly chop them. Personally, I prefer them roughly chopped. In a pestle and mortar grind your garlic, root ginger (reserve 1 tsp for later), cumin, coriander, Himalyan pink salt, and ground turmeric into a paste. Next add your coconut oil to a frying pan or cast iron skillet and then add yellow mustard seeds, and nigella seeds. Cook on a low-medium heat until the seeds begin crackle and jump around the pan. Add your chopped onion, spice paste, curry leaves, and onion. Sauté for 1-2 minutes before adding your banana peels, reserved shredded ginger, sliced red chilli, and desiccated coconut. Add 2 tbsp of water and reduce to a low heat. Cook until the banana peels are soft but tender to the bite and the moisture has dried from the pan. If you prefer a more moist curry then you may prefer to add ¼ of a cup of water when cooking. 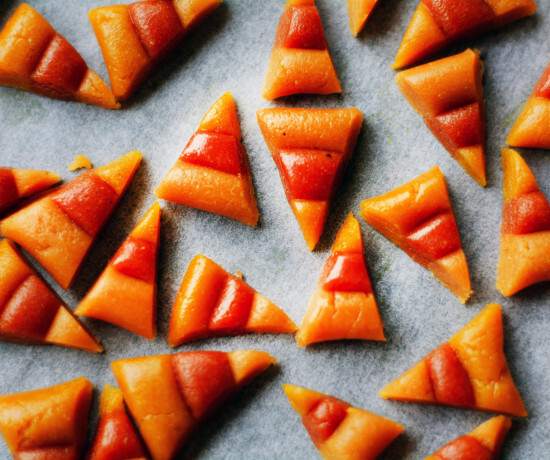 Squeeze over a little lime juice and serve with a garnish of fresh coriander. * Prep time includes a 30 minute soaking time for your banana skins.